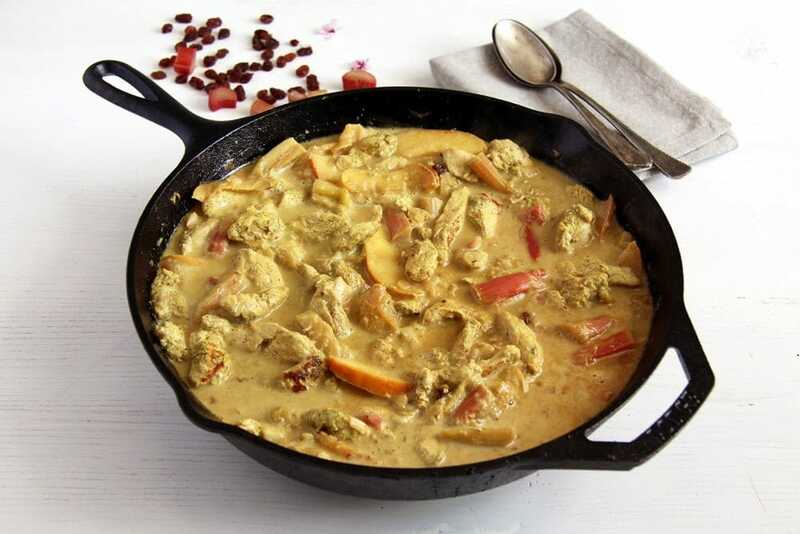 A very flavorsome chicken green curry with rhubarb, coconut milk, raisins and apples. 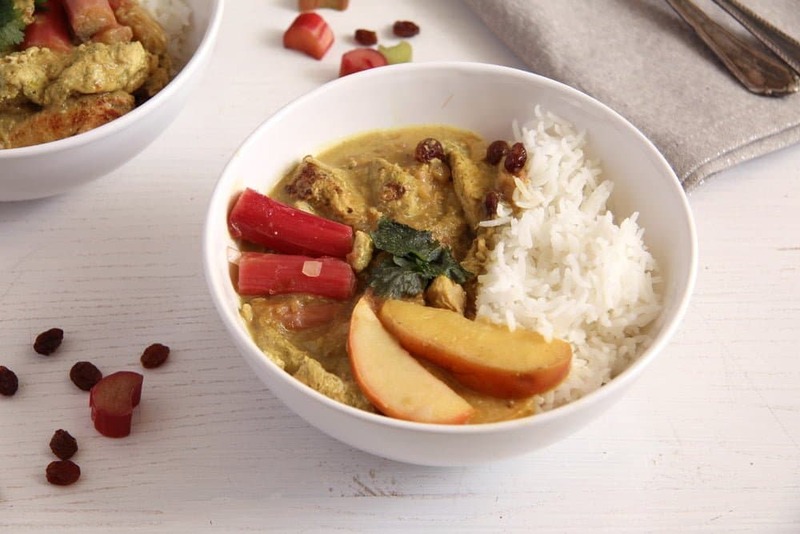 Another rhubarb recipe, another curry, hopefully you are still in the mood for rhubarb. I know I am, I am actually sorry that there are only two more rhubarb recipes to go, I could go on forever. Well, even if I won’t be posting anymore rhubarb recipes starting next week, I will still keep cooking and baking with rhubarb, the season has just begun, there is so much more time left for playing with rhubarb. 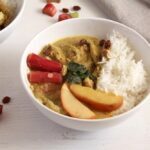 This curry was my favorite savory rhubarb combination this year, I didn’t actually intend to post another curry recipe after the Rhubarb Fish Curry last week, but this dish is too good to end up in the files. I paired rhubarb and apples again (love the combination) and added some raisins for sweetness. Some coconut milk also helps a lot in cutting through the tartness of the rhubarb, making the whole dish wonderfully creamy and giving it a lovely flavor. Otherwise I don’t know how April is treating you, but here is snowing!!!!! I could almost wish you a Merry Christmas. I was talking about the wonderful spring days only in the last post and now we have snow. It is not cold enough for it to stay put, it melts right away, but it has been snowing with interruptions all day long. Like really big flakes, almost blizzard-like from time to time… And when it doesn’t snow, the sun is shining!!! Crazy! 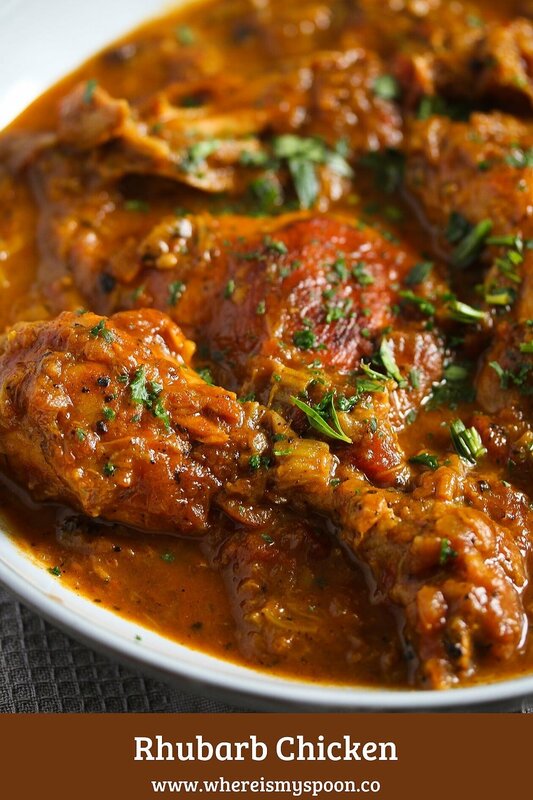 Nothing like a nice chicken curry to warm us up! Slice the chicken breasts into 2 cm/ 0.8 inch pieces. Finely chop the garlic, chili and ginger. Place everything in a bowl, add the curry powder, oil and vinegar, mix well, cover the bowl and marinate for about two hours. In the meantime clean the rhubarb and cut it into 3 cm/ 1.6 inch stripes. If the rhubarb stalks are too wide, cut them lengthwise first and then into the smaller stripes. Slice the unpeeled apple thinly and chop the onion finely. Heat the skillet and melt the coconut oil. Add the rhubarb, apple and onion and cook for about 2-3 minutes, stirring gently. Add the honey, stir again and remove everything from the pan. Wipe the pan with some paper towel. Take the chicken slices out of the marinade and cook in 2 batches, about 2-3 minutes each batch. Stir a few times to make sure that the chicken browns on all sides. 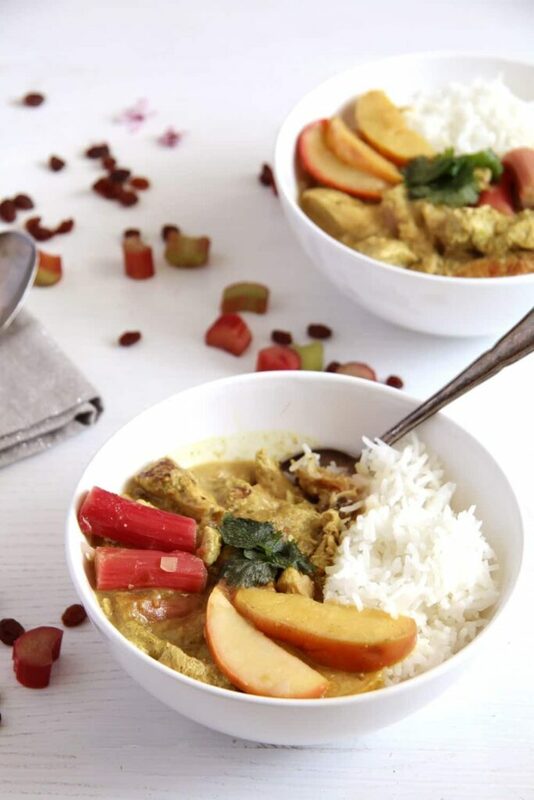 Give the rhubarb-apple mixture back to the pan, add the raisins and the coconut milk, reduce the heat to medium-low and simmer for about 10 minutes, the sauce should thicken slightly, the chicken should be cooked through and the rhubarb should be soft but not mushy. This post might contain affiliate links. 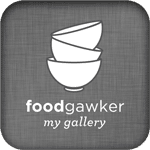 The price you pay as a consumer does not change, but if you make a purchase we will receive a commission which helps support the blog. 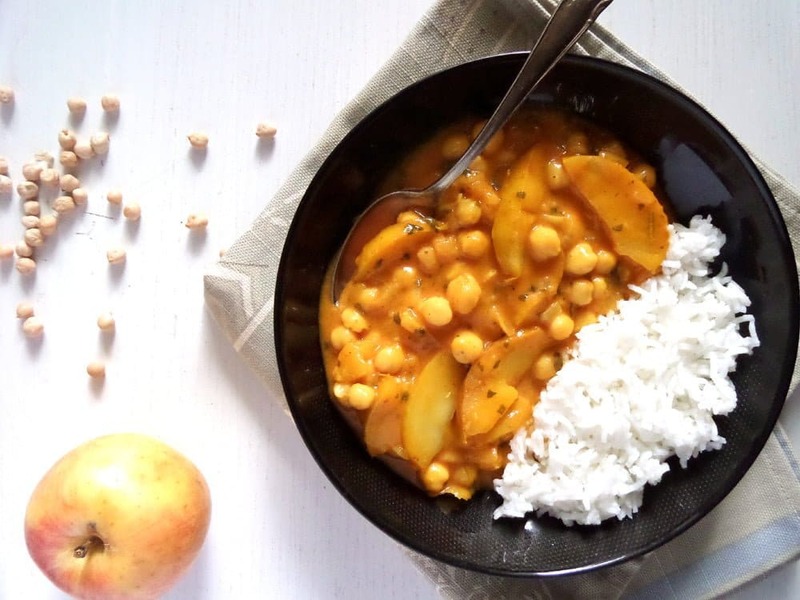 This is a wonderfully comforting curry Adina! Love the combination. I have everything to make it except rhubarb. Never seen it here. I’m sure it has a great impact on this recipe, but I will still try this curry without rhubarb. Oh my God, am I the only one who have not tried rhubarb yet? This is the third recipe I have seen today of rhubarb. This curry sounds like a great recipe. I’ll have to give it a try. 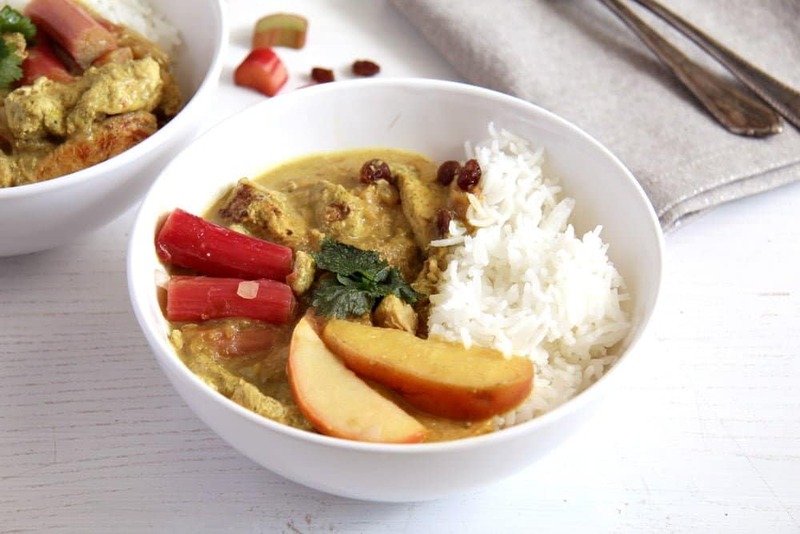 So very comforting and delicious, I love chicken curry and add of rhubarb is just brilliant. I honestly must be missing out since I have no experience with rhubarb. And I am now learning there is a ton more to do with it than just to bake it in a tart! This is great! 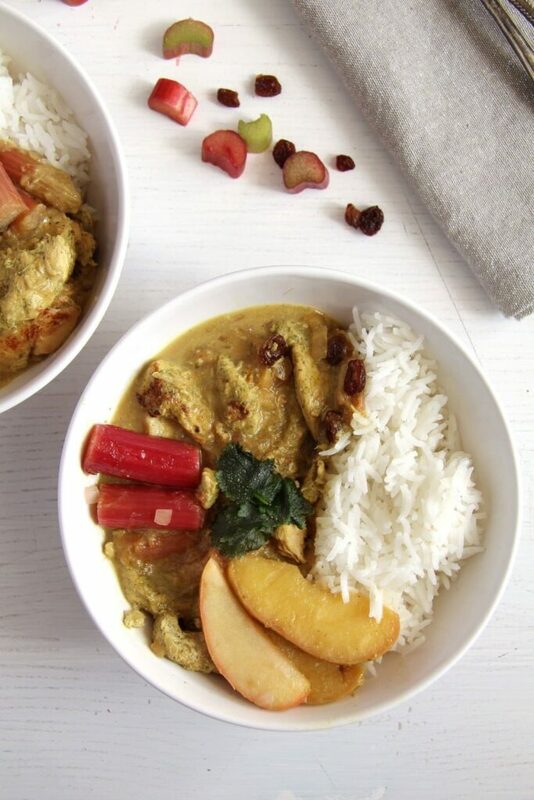 I’d never thought about adding rhubarb to curry but it makes total sense. Love it!